Former president of India APJ Abdul Kalam, an iconic figure in India, and a technocrat-turn-leader who inspired millions of people, especially, the children, passed away in Shillong on July 27. Kalam was 83. He was recipient of India's highest honour, Bharat Ratna. He had gone to North East, and was delivering a lecture at IIM, when he suddenly collapsed. Doctors said that it was a massive heart attack, which caused his death. Avul Pakir Jainul Abideen Abdul Kalam was born in Rameswaram in Tamil Nadu in 1931. His father was a boat owner. 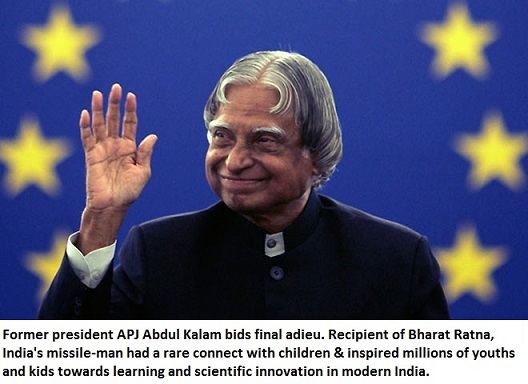 Kalam had worked from early childhood and distributed newspapers to supplement to the family's income. A bright student, he studied Aerospace engineering and went on to join DRDO as scientist. Later, he joined ISRO. The development of Missiles like Agni and Prithvi during his tenure, brought the title 'Missile Man' to him. In the 90s, he headed DRDO and was also the chief scientific advisor to the Prime Minister. He went on to become President of India. Kalam went on to become one of the most popular leaders in post-liberalised India. In fact, he managed to have a connect with the students, especially, children, which no one has had, probably, after first prime minister Jawaharlal Nehru. Kalam was also lovingly called 'chacha' by kids who felt inspired by him. There are few people in the history of modern India, who have been loved so much. While India has had far more popular politicians, it has had few 'leaders' who have been loved so much. People from all sides of the political spectrum liked him. When Kalam would visit schools, kids would flock to see him. He motivated them, gave them dreams. His autobiography 'Wings of Fire' has been a permanent best seller. There was something in Kalam, which made everybody admire him. A humble man, his first love was 'educating' students. Dr Kalam never cared much about protocol and remained active till his last breath. He travelled across the country, interacting with people. During his tenure at President too, he acted like a 'People's president'. In an era, when politicians invited scorn, Kalam emerged as a true leader, someone young generation could look up to. Even those who look at every thing from religious angle, looked at him differently. There was a blend of innocence and charisma in his personality. APJ Abdul Kalam has left an indelible mark on the minds of countless Indians, and there is no doubt at all that he is one of the greatest Indians ever, who will continue to inspire generations and who can never be forgotten. Can we have another leader like him? That's the toughest question. Rest In Peace, Kalam Sahab, for you were the real leader, a person who wanted India to achieve progress, who wanted children to dream big and turn their dreams into reality. Firstly, let me make it very clear that opposing death penalty doesn't mean that it is a voice in support of Yakub Memon. It is simply against death penalty to him. Keep him in jail for the rest of his life, just like others. But here you are are baying for his blood, while going extra-mile to save other hard-core terrorists' lives. The yardsticks are not the same, not at all. Rules are soft for one set of people, tough for another set, though crimes are same. There are a host of reasons why death penalty is being opposed vehemently in this case. People from all cross-sections are opposing it, not just those who are Muslims. And, as a democracy we should be mature enough to listen to dissent and voices opposing a decision. Death penalty has been abolished in around 100 countries, and there are individuals who oppose it on principles. It is also a fact that people from certain sections get death, others don't. A major factor is poor financial condition as person can't afford lawyers. As many as 94% who got death penalty in India were either Dalits or Minorities. 1. But there is another big issue. State plays a major role in it. They can definitely influence the processes that can delay investigation and the judicial process. Further, they can stop or delay executions. 2. 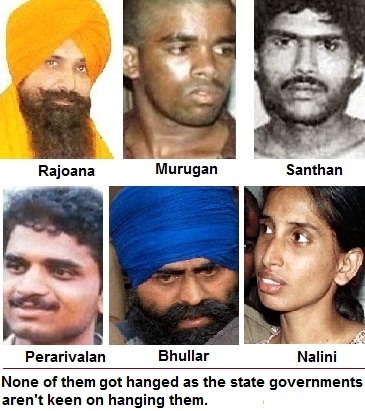 All those including killers of our former Prime Minister Rajiv Gandhi, the man who assassinated former chief minister of Punjab Beant Singh, the person involved in bomb blast killing 9 persons in Delhi, were NOT HANGED, because the state governments didn't want them hanged. It's so easy. They can delay it for years and years. Governments finally decide it, even after court verdicts. 3. The 'nationalist' BJP has an alliance with the Akali Dal in Punjab, so it can be 'tough on terror' but that's pure nonsense as we all know, how it is complicit in saving others in Punjab. It never made an issue about Rajiv Gandhi killers as it didn't want to anger Dravidian parties, whose support it needed for alliance at national level. But in Maharashtra, it wants to hang Yakub Memon, fast, as soon as possible. So law is applied selectively. 4. Courts give verdicts but governments have their own privileges and ways to delay or speed up the executions. Is that fair? The State--the might of the establishment, through prosecution, investigating agencies, can speed up or slow down any case. In the case of Babri Masjid demolition, CBI has failed to convict anyone till now. The situation is same in Mumbai riots 1992-93. 5. Cases of massacres and riots seldom reach the stage where the perpetrators could be convicted. Unimaginable things happen in case of mass killers like Babu Bajrangi and Maya Kodnani. They don't get death penalty, fine. But, they are even saved from jail terms, as they get released on parole due to 'State'. The officials in the government and jail, allow parole and don't appeal against relaxations in their cases, even if it is a double lifer. 6. 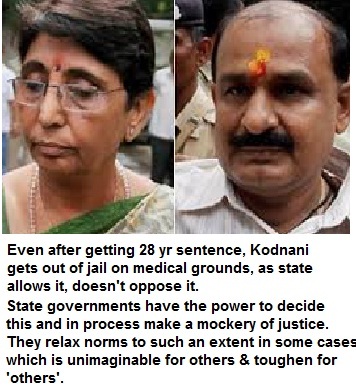 So people like Kodnani and Babu Bajrangi even come out of jails within a short time (on parole) after they are convicted (28 yr sentence to Kodnani, yet she gets released). State doesn't oppose, it is helping them. Other prisoners can't think of such relaxations. Is that fair? Where is justice, now? 7. In the case of Rajiv Gandhi's killers, state governments in Tamil Nadu stood up for them. Even J Jayalalitha tried to release them. In the case of Balwant Singh Rajoana, the jail authorities refused to hang him, as the entire state was behind him. Similarly, in the case of Bhullar norms were violated and now he has been shifted to a comfortable jail in Punjab. The death sentence was not executed for years, through delaying tactics, and hence Supreme Court, commuted it. 8. Governments can play with the law, it's a fact. Those who are not in government, can't do it, naturally. This gives a sense of victim-hood. So much concern is shown for poor health of Kodnani, loss of vision of Babu Bajrangi, but not slight mercy to let Afzal Guru meet his wife and kid, last time before death! It is a fact that there is a perception building up among Muslims that it is unfair to hand Yakub Memon, who had cooperated with Indian authorities, and came to India. So Maharashtra government, the 'rashtrawadi' [self-styled nationalist] won't delay, rather, hang him readily. Congress can't speak up for Memon, as it long back fell into the BJP's 'nationalist' trap. So in UPA tenure, it had to hang Kasab and Afzal Guru, fast, so that BJP couldn't have political gains. Memon has no one to back him. 9. No wonder, when MIM leader Asaduddin Owaisi speaks, there is immediate response from 'bhakts' is that he is supporting 'terrorist'. No, this is against death penalty to him. Many people don't want death penalty and feel that there is injustice in this case and they feel just Owaisi is speaking what they feel. Is that a good scenario, when people have such a strong perception of state bias? 10. Then, the media, particularly, loud TV channels create majoritarian opinion--refusing to give space to the 'other', plays a major role in deciding who gets death sentence and who doesn't. Alternative opinion must also be heard. Investigating agencies failed to catch the main perpetrators in the Mumbai blasts case. 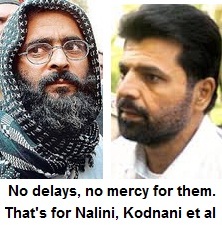 Yakub Memon's entire family came back, and Menon, through a certain dealing with investigating agencies, with a trust on Indian state, its judicial process, and his coming to India (with his entire family), helped India in its case against Pakistan on the international forum. When governments, through the might of the state, influence justice after the verdicts, it is also contempt of court. Law is blind, but the courts aren't deaf. It is time they hear the voices, take note of how governments misuse their powers in influencing justice. Politicians' iftaar angers right-wingers: Is there a world beyond the word 'appeasement' in India? Some people are unhappy with Indian politicians attending 'iftaars', especially, about the politicians who wear the skullcap (topi). It is disturbing to see so much anger on social media and abusive messages about these politicians. The anger is because they feel hosting 'iftaar' is appeasement of Muslims. A guy reacted, "Look, why don't they attend Hindu functions?" He didn't realise that the politicians attend so many religious functions of the majority community--at least in North India, that it is no longer news. From Bhagwat Katha to the Dussehra celebration, 'praan-pratishtha' to 'yagnas', they attend every religious function. This is natural because Hindus form the majority. The 'iftaar' is hosted once a year, and hence it becomes news, the photos are splashed in media. The other guy said, 'Why should Muslims' be entertained separately'. They are not entertained, buddy, there is something called multi-culturalism and goodwill gestures. Incidentally, he is the same guy who was delighted when US president hosted Diwali party and had posted the video on his Facebook wall. Why Barack Obama does it? Hindus are a minority in US, is it appeasement? No. There are certain basics, a few courtesies, decencies. I may not like it but I won't oppose it either. Another guy was upset that these politicians wear 'topis'. He tweeted that why Muslims don't sport 'tilak'. If you haven't seen a Muslim politician sporting 'tilak', then that's your issue! When confronted with photographs of Muslim leaders sporting 'tilak', there was no answer, rather, a query comes quickly about other forms of appeasement. To set the record straight, Hindus are six times the number of Muslims in India. And when it comes to politicians, the ratio is even more skewed. So you will see more Hindus politicians than Muslim politicians. 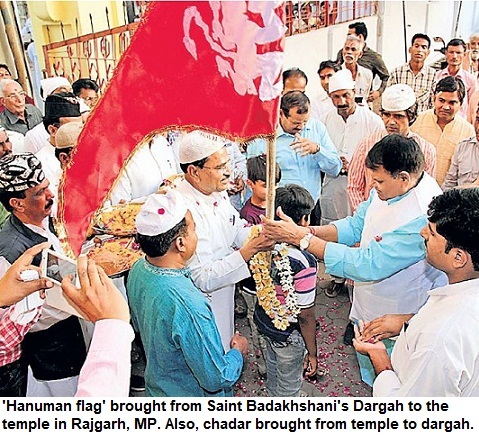 But if you start observing carefully the next time, a Muslim MLA or MP goes for campaign in your area, you may surely see some of them breaking coconuts, going to temples, seeking blessings of the priests. 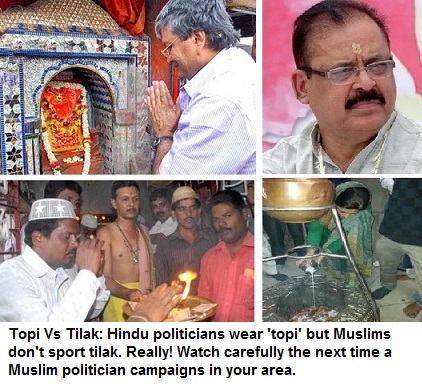 Upset with politicians for wearing topi, say no Muslim would ever sport 'tilak' but when confronted with photographs of Muslim politicians with 'tilak', there is a another accusation of appeasement of other kind..
Others zealously shared a report on a Hindi website that dealt entire with 'iftaar' and 'appeasement'. It expressed concern that politicians were not going to Christian and Sikh events. This is plain stupid. In areas where Christian and Sikh minorities are significant, the politicians go to there events too. APPEASEMENT ON THE OTHER SIDE OF THE BORDER! ....it's totally up to them. But, at least, show some basic intelligence, before talking about 'appeasement'. So what's appeasement? Whatever happens as per your ideology, vision, experience and intellect, is fine but whatever is beyond that, is appeasement! Isn't it! Sorry, things don't work that way. The country and the world can't run like your household or my household. 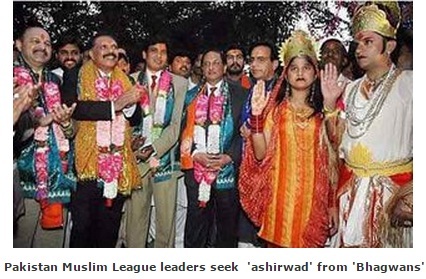 Ending this post with a photograph from our neighbouring country, where Muslim politicians seek blessings from Hindu gods, yes, in Pakistan. Shukat Mahal palace, a unique example of Indo-French structure, built during the reign of Nawab Qudsia Begam nearly 180 years ago, was in the need for restoration and it was repeatedly brought to the notice of authorities. 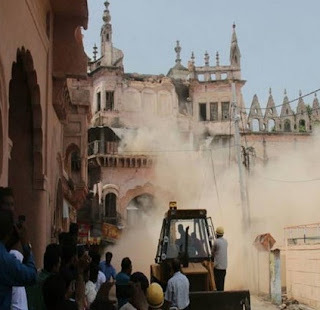 Yet, there was no attempt to save and strengthen the heritage building and when a crack developed on the facade of the structure this week, the civic authorities instantly went and demolished the portion--crown and two storeys on the front. This shameless display of apathy towards heritage is common place in the country, despite growing awareness about need to conserve the past and save the heritage structures. Bhopal is among the few cities that have have such abundance of heritage structures--palaces, historic structures and gates.Take for example, the royal complex near Moti Masjid, you will be overwhelmed by the grandeur of imposing buildings of the era when Bhopal was a princely state. On one hand, you have Gauhar Mahal, the beautiful Baab-e-Sikandari gates, while adjacent to it is Moti Mahal. Further, the Shaukat Mahal, Sheesh Mahal, Sadar Manzil and Humayun Manzil, along with the Moti Masjid and Minar-e-Iqbal, turn the place majestic. 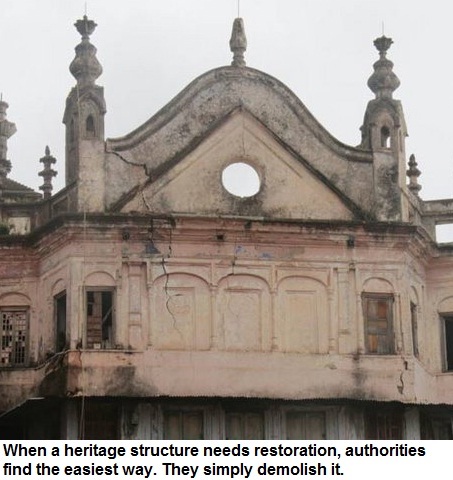 But successive governments and civic authorities have turned a blind eye to the restoration of these structures. The city of lakes has so much for tourists, yet, authorities have failed to even project it as a tourist destination. In fact, despite monuments, lakes, museums, mosques and dozens of tourist attractions, government has totally failed to harness the potential. Worse, the structures are crumbling and there is no attempt to save them--either on one pretext or the other. If one structure can't be protected because it is either Waqf property, or it can't be saved because it is not under a particular department's jurisdiction. There are so many bahaanaas, the pretexts--for yet another monument there is 'lack of budget' or a particular monument is 'private property'. The truth is harsh. Successive chief ministers and civic administrators have no vision and as a result the monuments are being destroyed. Citizens do share a part of blame. But this is also a fact that people came on the streets to save structures in the past, which government wanted to demolish. Especially, in the case of Jumerati Gate and Old post Office. Majority of officials and ministers have little interest in saving heritage. Hence, handful of activists and protesters' voice or demonstrations are just not enough to shake the babus. The heritage is being ravaged by careless civic officers, land grabbers and the illegal encroachers. What can be more tragic than the fact that we are all witness to this shameless destruction of heritage.